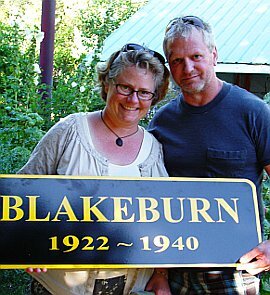 The Coalmont Community Association had decided that it would pay for a sign at the old Blakeburn town site. It is after all an important part of our history in this area. Both tourists and those who work up that way have been asking, and we must remember that workers are not all from here. In fact some of them come from the UK and Australia and are particularly interested in the history of coal in this area. In any case, before we could get a quote and a quorum to vote on paying it, James and Sharon McCulloch donated two signs which they paid for out of their own pockets. Their son, Jake, works at a shop where these signs were made. James and Sharon are building the house on the corner of Campbell Avenue and Columbia Street. It’s a weekend project so they’re taking their time, but it’s coming along nicely now. Eventually they plan to retire here. The donation of these signs shows a real sense of dedication to the community. Thanks for the signs – and welcome James and Sharon! That is a very beautiful sign. Thank you so much for having it made and donating it to the area.